What’s that jingling sound I hear? It’s . . . The Vintage Village No Sleep ’Til Christmas Fair! When: Sunday 13th December 2015, 10.00am to 4.00pm. Where: Stockport Covered Market Hall SK1 1EU. How much: £2.00 entry, concessions £1.50, under 12s FREE. Who doesn’t love Christmas? The tinsel and sparkles, Santa and his sleigh, the sack of presents, the joyful children, the groaning dinner table laden with food, the groaning bellies afterwards, the rubbish on telly, the credit card bills in January. Ok, maybe not everyone loves Christmas, but you’ve got to love a good vintage fair or you wouldn’t be reading this! Our multi-award winning fair is the ideal opportunity to gather some unique and stylish gifts to delight your hard-to-please family and friends. 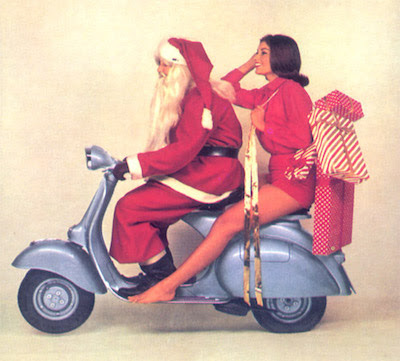 Or just buy something nice for yourself - and bah humbug to all that Christmas palaver! - from up to 70 stalls heaped with dazzling arrays of genuine vintage items for ladies, gentlemen and the home. ✭ Live DJing from the immaculately cool Club Interzone (not Twisted Sisters as previously advertised, apologies). ✭ UPDATE! 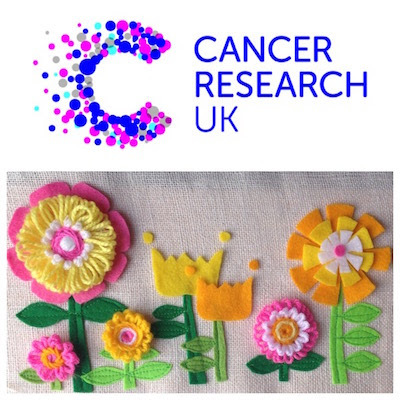 Cancer Research UK (Withington Branch) will be holding a raffle for a fabulous fabric flower picture handmade by Jodi-Jo-Retro. The draw is at 2.30-3.00pm, and all proceeds go to CRUK. ✭ UPDATE! All Our Yesterdays has 10% discount vouchers that will be available at both our doors as a Christmas treat and thank you to all his customers. ✭ UPDATE! New one-off trader Rainbow Drops Vintage is having a massive liquidation sale! There's a £10 rail, and coats and furs from £15! ✭ UPDATE! Kitsch Republic is having a Vintage Sale! ✭ UPDATE! Eclectique Chic has some special Christmas reductions on their vintage clothing! ✭ And Santa says he'll bob over for a bit too! Delectable refreshments are available from the mighty Lord of the Pies, the marvellous Wrapscallion offering organic and healthy wraps for vegans/veggies and carnivores (and breakfasts! ), the inspired Stuart Thornley Cake Design for all your sweet treat needs (and lovely Christmas specials), and divine coffee from Cafelito's delightful little blue van. Let us know if you're on your way on our Facebook event page, ta! Finally, here's the tally of terrific traders waiting to give you a big festive welcome! A Vintage Affair - pretty vintage china, teaware, glassware, linen and cutlery from a bygone age along with some retro bits and bobs. All Our Yesterdays - vintage homeware, furniture, luggage, collectables, toys, tins and much more. Get yourself a 10% discount voucher at one of our doors to use on any of Wayne's fabulous goodies! Aspidistra Vintage - mid-century glass, ceramics, jewellery and fashion. Bluecat Jewellery - vintage clothing, accessories and homeware. BRG Collectables - vintage clothing, accessories and homeware. Bridgemont Vintage - eclectic vintage, country house, interiors, antiques - now ensconced in 20th Century Stores. NEW! Cancer Research UK - Withington - a selection of their finest vintage items, plus a fund-raising raffle to win a beautiful fabric flower picture by Jodi Jo Retro. Dabberdecades - only the best 1960s-70s clothing, accessories, jewellery and homeware. Eclectique Chic - women’s clothing and accessories 1930s-80s - special Christmas reductions! ; costume jewellery and homeware 1950s-80s; saucy vintage prints. Essentially Eagle Vintage - an eclectic mix of mid-century clothing, furniture and homeware. Fiona Barber - vintage tea sets, ornaments, collectable records, cards, vintage and hand-crafted jewellery and hair accessories. French Vintage Heaven - French vintage curios and collectables. Garbo Antiques - vintage clothing, accessories, costume jewellery, fabric and trimmings 1880s-1960s. With even more Garbo at 20th Century Stores! Gem’s Bits n Bobs - vintage apparel, bric a brac, kitsch, toys. Heirloom Rose - vintage women’s clothing, shoes and accessories 1940s-70s. Heritage - Art Deco and original French antiques. Jane Hamilton - specialises in quality vintage designer clothing from the 1950s-60s. Jean Blakeley - vintage jewellery. Jim and Keith - collectables, bottles, gramophones and your general mantiques. Kitsch Republic - vintage and retro homeware and gifts. Make Do and Mend - vintage clothing and homeware. Mary Jones Vintage - high class vintage and glamour from the roaring 20s to 80s. Maureen Woodman - vintage homeware, kitchenalia and books. Memories Are Made Of These - mid-century homeware. Mick’s Goodies - weird and wacky collectables and small furniture. Mirabel Vintage Silver - vintage silver jewellery. Miss Retro - ladies’ and gents’ vintage clothes, shoes and accessories. Modernist Mid-Century - vintage film and advertising posters, homeware and decorative items, more posters available at 20th Century Stores. Moor Vintage - vintage clothing, collectables and jewellery. Mrs M Vintage - vintage retro kitsch homeware. Nostalgic Nights - ladies’ clothing and accessories 1940s-50s; curtains mid-century. Out of the Past - men’s vintage clothing and accessories, 1950s-80s. Parrot in the Pantry - vintage china, homeware and kitchenware 1920s-80s. Pop Culture 101 - An eclectic mix of vintage, retro and classic pop-cultural items, from books to vinyl, magazines to toys, games to collectors items. NEW! Rainbow Drops Vintage - liquidation sale! Vintage clothing, handbags, jewellery, accessories, fur coats ranging from 1950s-80s. NEW! Razzle Dazzle - homeware and rock’n’roll related items. Retro Clobber - 1960s-80s men’s vintage and designer clothing and accessories. Retrofit - vintage treasures and collectables. RetroFunky - homeware, decorative items, toys, small furniture, household linens. RIPE - 1960s and 70s ladies’ and menswear. Rita Black - vintage homeware, collectables, small furniture. Sheila’s Store - vintage jewellery, homeware and luggage. Shiny Shilling Vintage - vintage retro and kitsch homeware items from the 1940s-70s. Snygg - "Stockport's funky pot royalty" bring their selection of stylish mid-century ceramics, glass and decor, including furniture and a bespoke lampshade service. Now trading from 20th Century Stores. This divine fabric flower picture handmade by Jodi Jo Retro could be yours! Just buy a £1 raffle ticket from Cancer Research UK's stall and keep all your finger's crossed! The draw is at 2.30-3.00pm. Have you got your Christmas outfit sorted? Here's an idea for you! 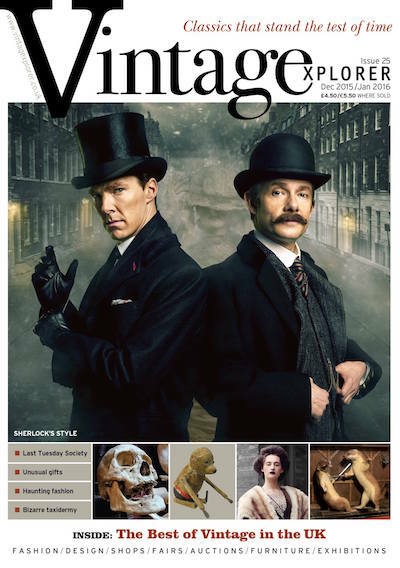 The new issue of Vintagexplorer magazine will be available at 20th Century Stores. Pick up your free copy during our fair! Strange Boutique - mid-century homeware, material, kitchenalia and other interesting bits! Stuart Thornley Cake Design - maestro of the cake-baking art! T.E.A. - women’s clothing and accessories 1970s-80s, costume jewellery and mid-century homeware. The Grand Collector - 20th century collectables, ceramics, homeware and men’s and women’s fashion. The Side Room - vintage clothing,linen, costume jewellery, cutlery and homeware. TinTrunk - a growing range of top quality 20th century luggage plus costume jewellery, homeware, textiles, collectables. Find TinTrunk at 20th Century Stores. Top Notch - vintage clothing, accessories, homeware. Value Vintage - vintage men’s and women’s clothing and accessories. Newly arrived at 20th Century Stores too! Vintage Clutter - vintage haberdashery; men's and women's accessories. WaxDelirium - vintage vinyl, now resident in 20th Century Stores. We Used To Have One Of Those - vintage photographic, audio-visual equipment and media; toys, games, novelties, books, magazines, posters, homeware and ephemera.